Hey everyone…hope you all had a good (and relaxing) weekend! We’re having crazy warm weather again so I popped outside and brought a little Christmas cheer to my front porch. The sitting area, at this time of year, is really just for show. I turn on the lamp at night and with the other white lights it’s very cozy from the curb. Nothing is new. The pillows are from my Christmas line in my Etsy shop. These neutral little pillow covers go with anything. 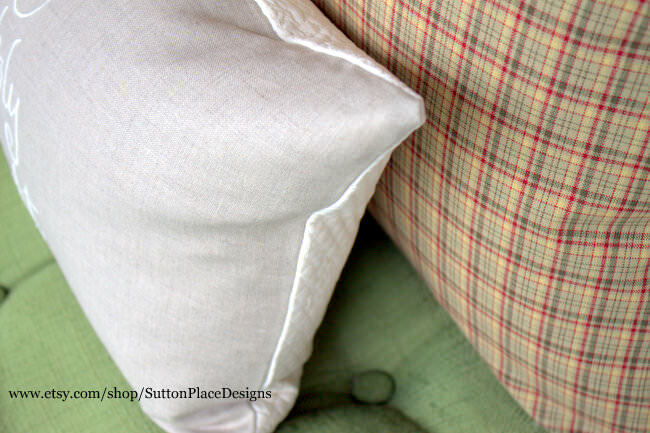 The homespun plaid I used for the bigger pillow covers is amazingly neutral, yet festive at the same time. Of all the fabric I have in my shop, this is one of my favorites. 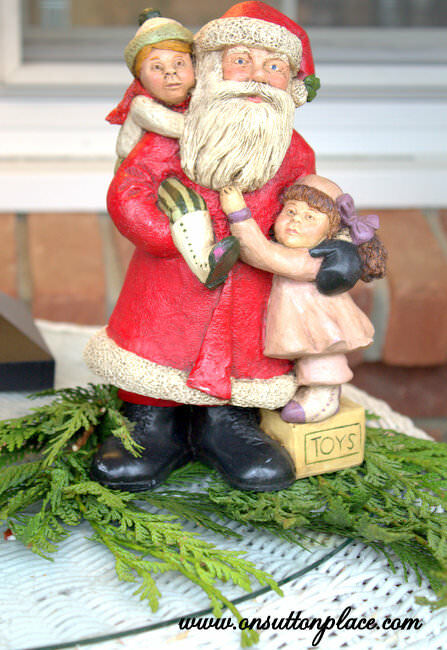 This Santa is one of my most treasured Christmas pieces from many years ago. I went through a phase where I bought anything depicting two children…one boy and one girl. My kids will have to fight over this one! I’m doing pretty good at my neutral and natural Christmas theme…as well as using things I already have. I sort of feel like Mary Poppins, in one of the nursery scenes, where she keeps pulling items out of her satchel. I just go to my garage, dig around in the bins, and come in with something old and wonderful. 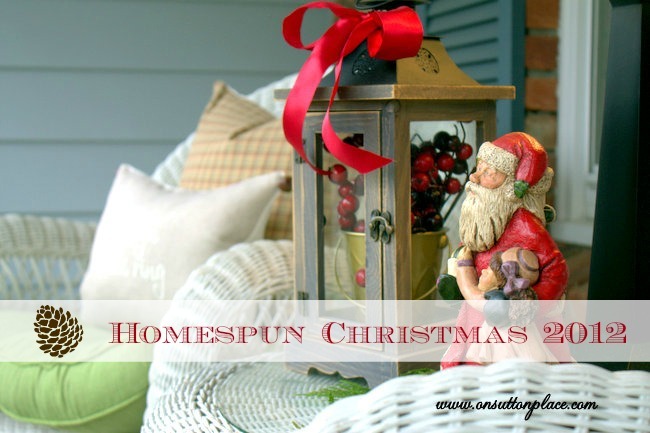 Our Homespun Christmas Link Party continues this week with Anita at Cedar Hill Ranch. Her theme is anything handmade for the holidays. Her linky goes live on Thursday, December 6th at 8 pm EST. On to decking the rest of my halls! Ann, Your porch is darling. 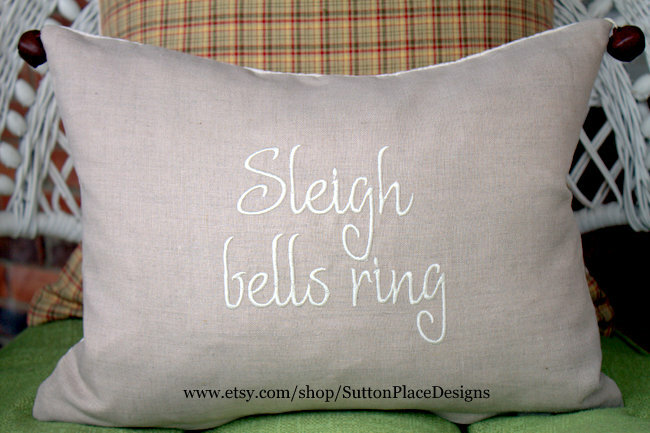 Love your Christmas pillows and the homespun plaid. The little Christmas vignette with the lantern is so cute. .I know about having things from long ago..especially Santas. So pretty. Your porch looks so cozy and inviting. Santa can sit and have some hot chocolate there. Beautiful, Ann!!! Makes me want to pop over for a visit, sit on your porch with you and a cup of coffee and chat for a while. Very relaxing! Thanks for sharing your wonderful pillow, too. Love it all! Just stopping by from the WOW party to see your front porch. I love those pillows and everything you have done reminds me of a simple country Christmas. I love it! AnnI loved seeing all of your pretty pillow designs in your shop. You porch looks so inviting and *pretty* I wish I had the time to participate in some of these Christmas linkies, but unfortunately I’m barely keeping my head above water right now! I love your porch, Ann, I want to come over and sit on it for a spell. I hope you don’t mind. Haha! It’s actually warm enough where you are to sit there too. Not here, it’s below freezing, but the wind is blowing fiercely. Good luck with your dough bowl. At least they are a great conversation piece. By the way, I am using my monogrammed red and white ticking dish towel in my kitchen with the Christmas decorations. I love it. Ann…I so love seeing your porch … you always do such a fabulous job for every season…just love the santa!…Have a wonderful week “Miss Poppins” !! It was 70 degrees in Chicago yesterday … perfect porch weather. 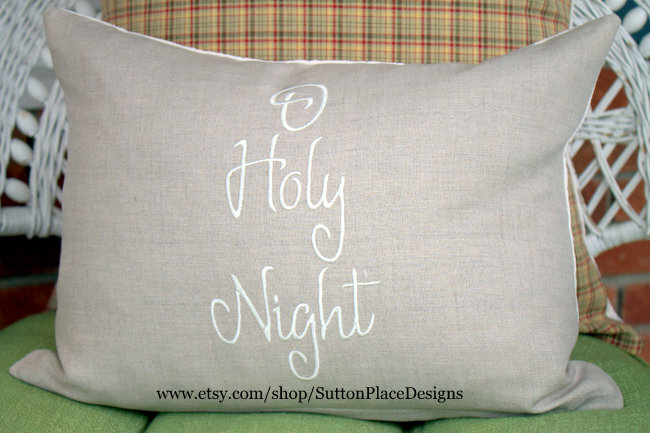 My favorite of all … the O Holy Night pillow … so lovely. My daughters, sometimes think I am Mary Poppins, pulling things out of my magic bag. Your porch is so pretty!! Love your pillows!! Do you have a sewing/embroidery machine? I used to work at a sewing shop and we sold them. I had one for years, but went up to a small professional embroidery machine…and recently got a new sewing machine. Your porch is always so pretty! I love the sweet Santa and especially what it represents. Charming! It is simple, and sophisticated. For some reason I am missing your posts again (still seeing them on FB). Why can’t blogger behave? Ann thisd look beautiful, I love the pillows and the santa figurine. Warm here too Anne but only supposed to be in the high 30’s tomorrow. I love your porch so very well put together and I love the lamp on the porch too. I’m doing good too buy using what I have and not bringing out more from the basement, feels really good this year to do that! Hi Ann, Everything looks wonderful on your porch! Your pillows are wonderful and just the right touch. Love your look! It all looks great, but if I could find a Santa like that, into my shopping cart he would go!! Your porch looks very pretty Ann. 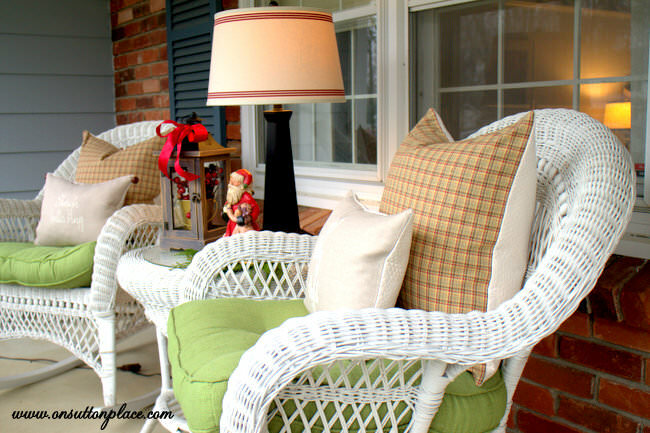 I love the pop of green in the cushions and the “O Holy Night” pillow. Love your porch. So tasteful! Love your pillows, they make every place more charming. I love your porch and those pillows are so beautiful!! Regards from snowy Finland! Ann, it has been so unseasonably warm that you could probably sit in those rockers on your porch and sip some iced tea! 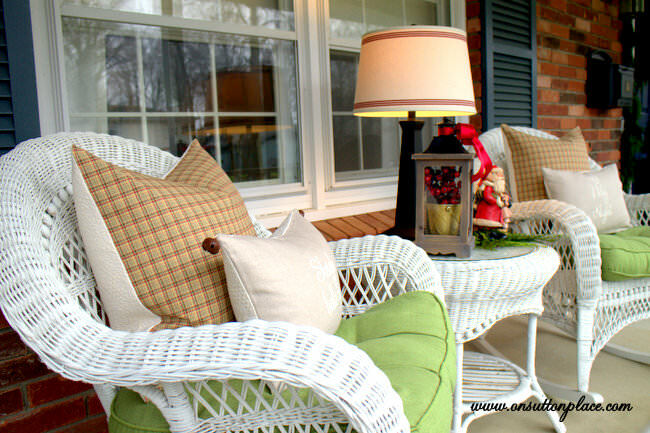 Everything on your porch does look so cozy, especially with your marvelous pillows. I’m thinking about ordering one but I just can’t decide on which one because I like them all! 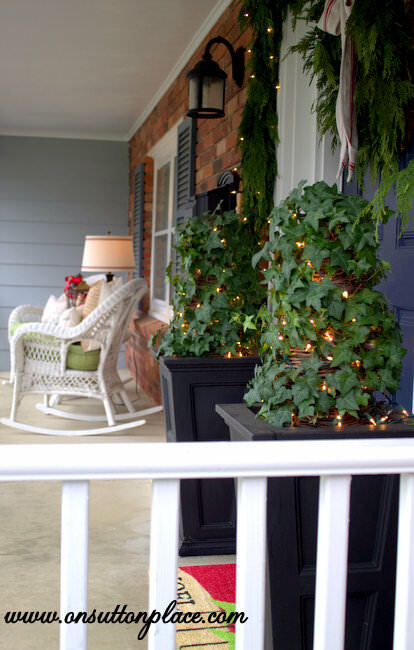 I’ve started decorating our front porch and I need to finish today before the cold weather blows back in! Ann your porch is beautiful, I absolutely love it. Looks great, Ann. Warm here, too and doesn’t feel like it is almost time for Christmas. I hope it cools down soon.